Landaas & Company newsletter March edition now available. Wholesalers built up inventories in January for the seventh month in a row, and at a higher rate than analysts expected. 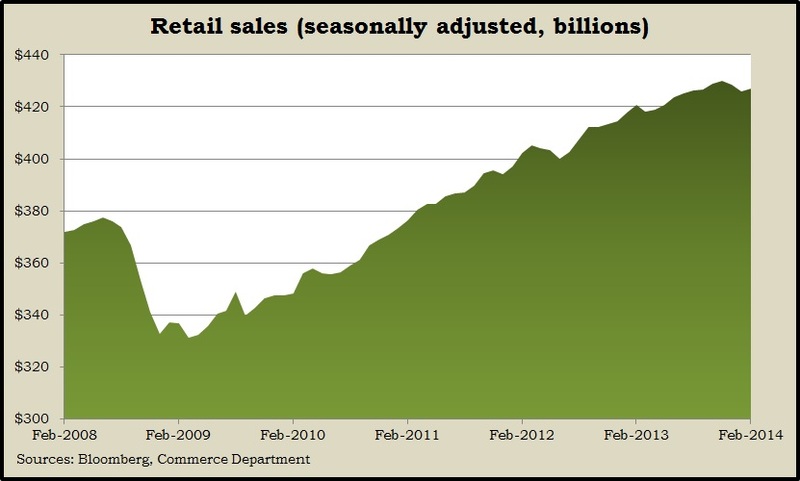 The Commerce Department said sales declined for the month at the wholesale level. At least some of that drop might be attributed to one-time weather-related factors. Typically, when supplies are rising faster than demand, companies need to slow production or even cut back. A chief indicator of consumer spending, retail sales, rose more than analysts anticipated in February, though year-to-year growth slowed. The Commerce Department reported that nine of 13 sales categories gained from January, although weather-related factors could be clouding the bigger picture. January sales declined more than previously estimated, led by the second-straight reduction in automotive sales. Year-to-year, sales increased 1.5%, the lowest since November 2009 and about one-third of the 30-year average rate. Businesses stocked shelves at a faster rate than analysts expected in January. As with the wholesale report Monday, inventories rose while sales contracted, according to the Commerce Department. Even on a year-to-year basis, business inventories outpaced sales, putting companies in a position of curtailing production before they find themselves with full warehouses and nowhere to move the merchandise. The inventories-to-sales ratio reached its highest level since late 2009. Weather may be a short-term factor in the sales decline. The moving four-week average for initial unemployment claims fell for the second week in a row, the Labor Department reported. The level dipped to its lowest point since December and remained below the 47-year average, signaling an ongoing reluctance by employers to let workers go. The Producer Price Index declined in February for the second time in four months, according to the Bureau of Labor Statistics. A drop in costs for services led the dip in wholesale inflation. The year-to-year wholesale inflation rate dropped to 0.9%, the lowest level since May. Lack of inflation suggests the economy is still weaker than Fed policy makers believe it should be. A preliminary look at consumer sentiment for March showed declining optimism toward financial prospects six months from now. The report from the University of Michigan and Thomson Reuters indicated higher opinions on the current state of the economy. The overall sentiment number, however, fell below analyst forecasts and was the lowest reading since November. Send us a question for our next podcast. Subscribe to Money Talk video updates via the Landaas Money Talk channel on YouTube. Landaas newsletter subscribers return to the newsletter via e-mail. No client or potential client should assume that any information presented or made available on or through this website should be construed as personalized financial planning or investment advice. Personalized financial planning and investment advice can be rendered only after engagement of the firm for services, execution of the required documentation, and receipt of required disclosures. Landaas & Company performs investment advisory services only in those states where it is licensed, or excluded or exempted from state investment advisor licensing requirements. All responses to inquiries made by prospective customers to this internet site will not be made absent compliance with state investment advisor and investment advisor rep licensing requirements, or applicable exemptions or exclusions from licensing. Please contact the firm for more information.